The Quantifiable Edges Capitualtive Breadth Indicator (more commonly known as the “CBI”) was introduced in just the 3rd blog post I ever did on January 6, 2008. The CBI was devised from a system I use to trade individual (primarily S&P 100) stocks and sometimes ETFs. I devised the system in 2005 and refer to it as my “Catapult” system. The Catapult was designed to take advantage of extreme (often capitulative) selling in these securities. 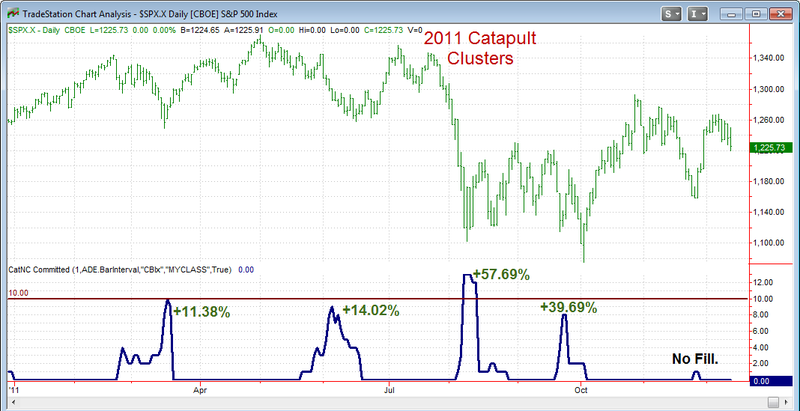 The CBI reading is basically a count of the open Catapult triggers at any one time among S&P 100 stocks. What I noticed early on was that broad triggering of this system was frequently a sign that not only were these individual stocks primed for a bounce, but the market as a whole was also very likely to bounce. I have written an awful lot on the blog about edges that could be found by entering the market when the CBI reached certain levels. Traders that would like to examine any of that research more closely are always welcome to use the “CBI” label at the right hand side of the blog. It will pull up all associated posts. In February 2008 I began the Quantifiable Edges Subscriber Letter. As part of the letter I included signals for my Catapult System. The success of the Catapult trades over the years has made it an attractive and somewhat popular feature for subscribers. I publish any signals that occur that night in the letter. Then using a limit order the next day I track them in the letter as well. When the exit signal occurs I also note this. The standard exit for a Catapult is at the open the day following the exit trigger. (On occasion I will send intraday updates alerting subscribers that the exit will trigger at a certain level and I am going to exit the trade at the close rather than waiting for the next day’s open.) While many subscribers have profited from the Catapult trades, there has been one common complaint. 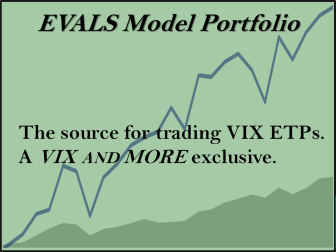 The complaint is that since the Catapult is the one system on the site in which I do not reveal the entry and exit criteria it makes the trades uncomfortable for some traders. Not knowing when (or exactly how) the exit will come has prohibited some subscribers from ever entering these trades. They have instead watched many go by and found themselves a bit frustrated that they couldn’t take advantage without understanding the exit criteria. So I set about to solve this issue. Recently I released to subscribers the “Catapult Exit Designer” for Tradestation. The Catapult Exit Designer is open code that triggers entries as listed in the Subscriber letter over the last 4 years (over 250 trades) and allows the users to test their own exit criteria. It generates files for them with results of all trades. And for those subscribers that don’t use Tradestation, I show all the code and explain all the logic behind it so that you may easily transfer it to you preferred platform. 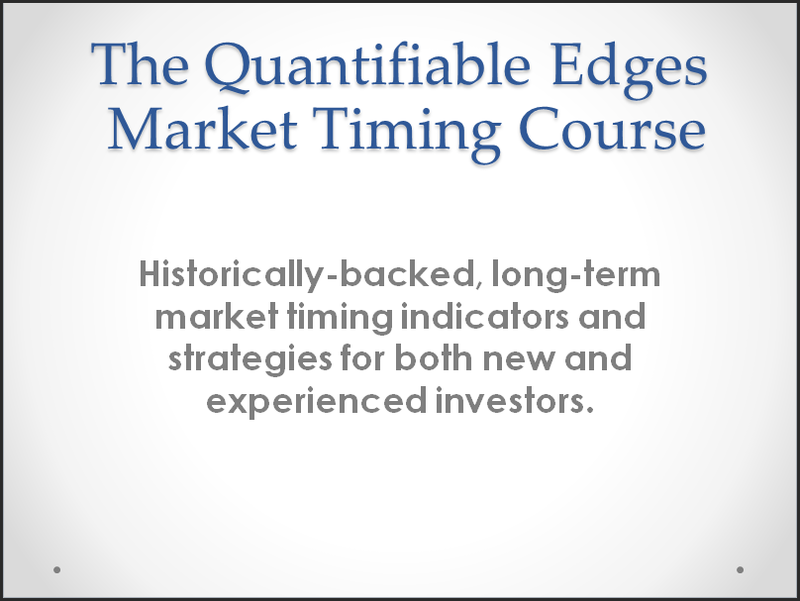 In addition I provide sample exit strategies that would have produced results very similar to the actual Catapult exits. The Catpult trades have done very well over the years. Of those that received fills and were tracked in the letter over 72% were winners, the average trade made 3.35% and the profit factor has been an impressive 3.32. What has most attracted me to this strategy is not just the fact that it has made money, but WHEN. Catapults generally trigger when the market gets scary. They happen when other systems and techniques I employ have sometimes struggled. So they have not only made me money, but they’ve done so when other methods were losing. This was greatly useful in helping me to limit or avoid drawdowns. The timing of the trades can be seen in the chart below. The top of the chart shows the S&P 500. The indicator on the bottom is the CBI. 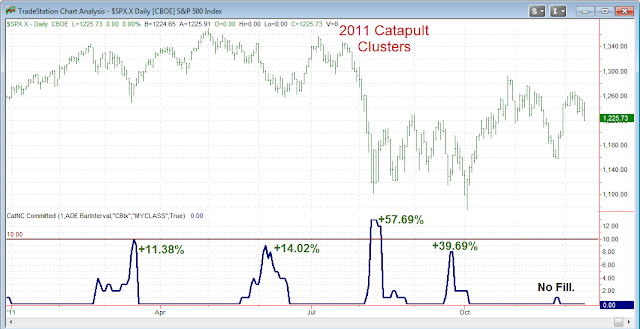 One way I track catapult trades is by “clusters”. A cluster of trades begins when the CBI moves above zero and it ends when the CBI returns back to zero. Historically I found over 90% of clusters would have been net winners had you taken all the trades in the cluster with equal size. (The last cluster that had a net loss was about 2 ½ years ago.) Above each cluster in the chart is a number. That number shows the net additive gains that would’ve been generated by that particular cluster. This year all the trades have come in 4 big clusters. And they all came during sharp selloffs when other methods may have been under stress. I’d be happy to show years 2008 – 2010 but this post is already way too long. If you want to see those results you may use the link below. They are shown there. The Catapult System has been a favorite of mine and of subscribers over the years. Hopefully with the new Catapult Exit Designer more people can begin to take advantage of the opportunities the Catapult System identifies. If you think there might be some tough times in 2012 and would like to implement a method that can possibly take advantage of them, then the Catapult System may be one option. Both the Catapult System triggers and the new Exit Designer are completely included in a Quantifiable Edges Gold Membership.